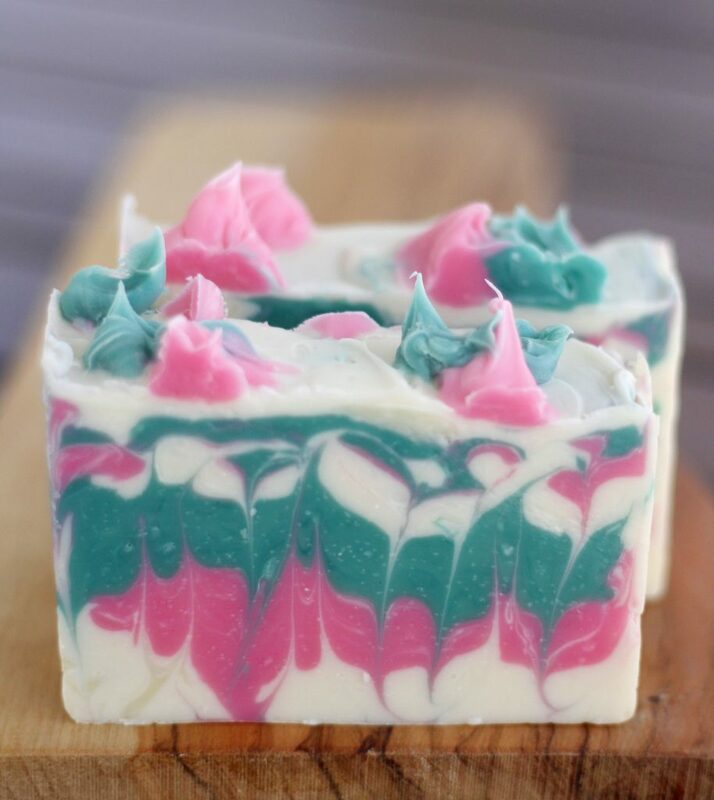 This soap was inspired by a beautiful spring-like day we had back in February before we got buried in masses and masses of snow. It was 75º outside and we were wearing t-shirts and flip flops. The kids and I spend the whole day outside, it was just gorgeous. I want that again!!! Come on spring you can do it. Since starting this little blog I’ve had quite a few people email me requesting a coconut oil free soap due to allergies. 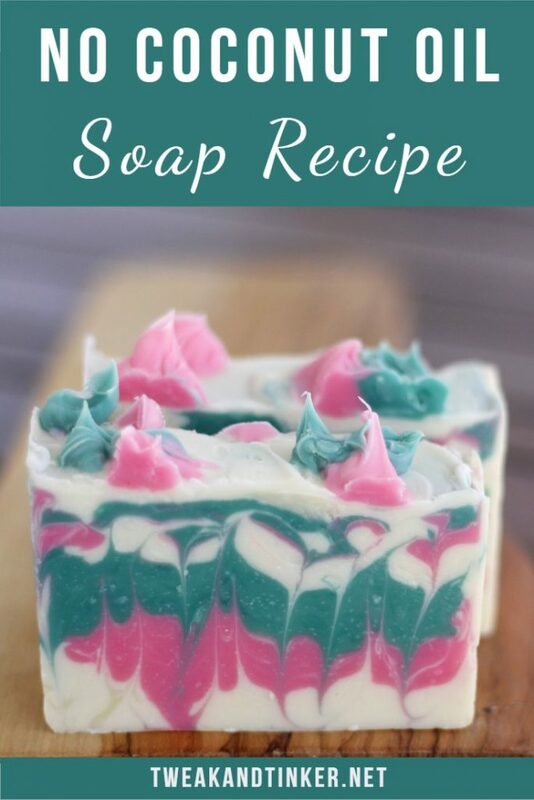 And since I love coming up with and testing new recipes (seriously, I find running a recipe through SoapCalc and seeing if the numbers match up super exciting) and love a good soapy challenge – here it is. As a little bonus it’s even palm oil free as well. 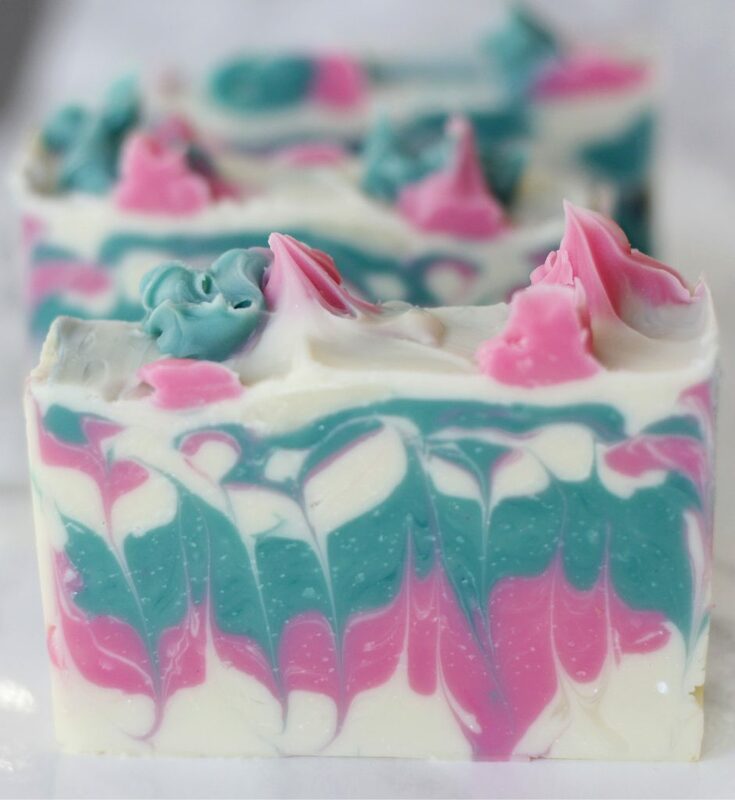 The technique I’m about to show you is definitely not something you would want to attempt as a beginner, but you can certainly use the recipe and create a beautiful one colored soap. If you prefer using an essential oil you can do so too. I use eocalc to calculate safe usage rates for essential oils. 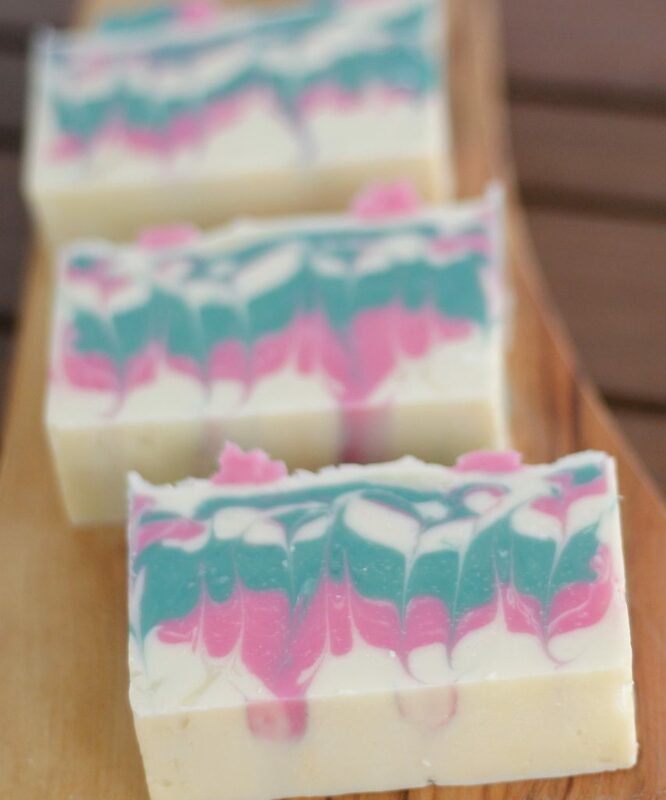 The reason why this soap is a little tricky to make is that I use a floral fragrance oil (it’s terrific by the way). 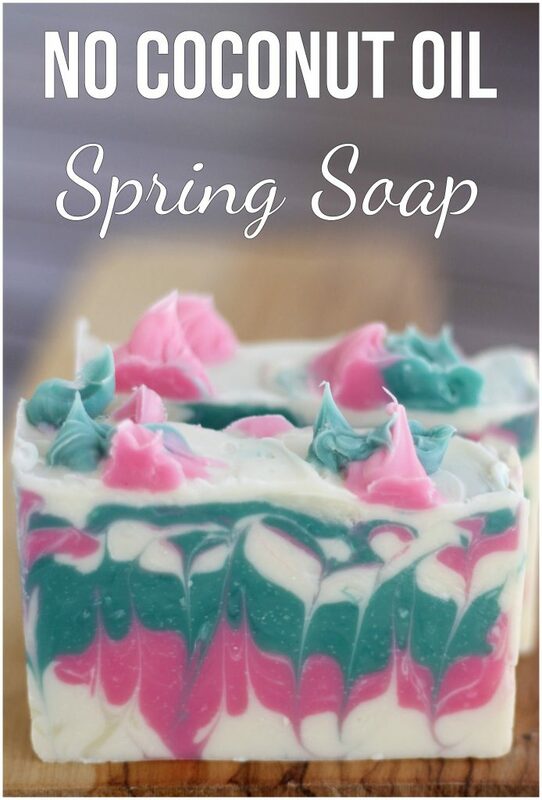 What would a spring soap be without a nice flowery scent, right? Here’s the deal with most floral fragrance and essential oils – they accelearate trace, meaning your batter can go from nice and fluid to super thick in a second. That’s exactely what happened to me in the video. I meant for it to get a little thicker so I could layer it, but I used the stick blender for 2 seconds too long and uh–oh, I could barely work the colors in. When I shot the video I thought for sure this was going to be a soapy fail. The batter was so hard to work with and I was so focused on getting everything in the mold in time that I was a little sloppy. 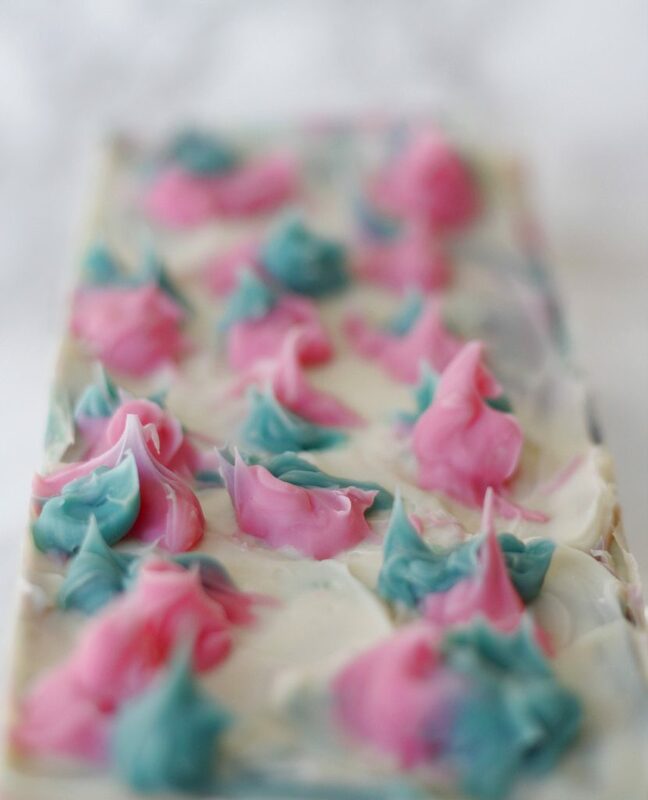 But – and that’s the beauty of soap making – you just never know, and in the end it turned out pretty cute I think. This post contains affiliate links, meaning at no additional cost to you will I earn a commission if you click through and make a purchase. If you’ve never made cold process soap, I suggest you check out my articles on lye safety and my beginner tutorial. This recipe is sized for the Crafter’s Choice Loaf Mold, you can resize it for any mold you wish using soapcalc. I’m using a lye concentration of 35% and a superfat of 7%. When you’re done layering, tap your mold thoroughly on the table. Thick trace tends to harbor big air pockets. If you wish to gel your soap, place in oven at 170º F for an hour. You can read more about it here. After 36 hours unmold, cut into bars and cure for 4 weeks. THANK YOU!!! 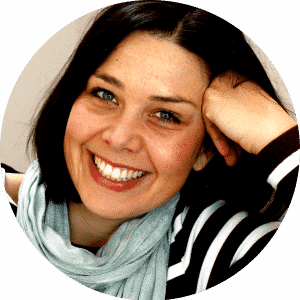 I have an allergy to coconut oil and it is hard to find recipes that do not contain it. You’re very welcome. I plan to do more coconut oil free recipes in the future since you guys really seem to appreciate it.